Description: Join us to make three wooden pumpkin posts! Great to display on a mantle or on your porch. These hand painted pumpkins have tons of possibilities: stripes, polka dots, chevron, etc! We will provide the three posts, a few stencil templates, orange and white paint and tree stems – OR bring your own inspirational paint and template/stencil ideas to design the perfect combination! 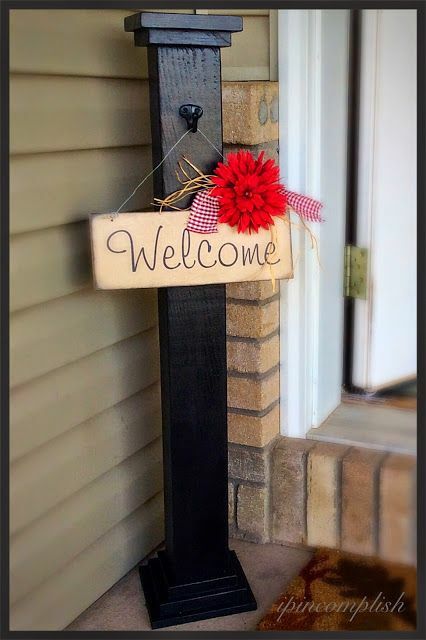 Description: Need somewhere to hang a cheerful greeting or holiday sign INSTEAD of your door? or a sign post to travel with you to a demonstration/sales booth? Back by popular demand, we are again offering the supplies to make this 44″ tall versatile post. We provide all of the wood and hardware, black paint and two 16″ wooden signs with hooks to hang. RSVPs for this craft are due by Wednesday, September 16 so we have enough supplies. *$1 added for credit/PayPal payment.